First prepare the chicken but trimming any excess fat and discarding. Cut each breast into 2 inch cubes and set on plate while preparing the marinade. 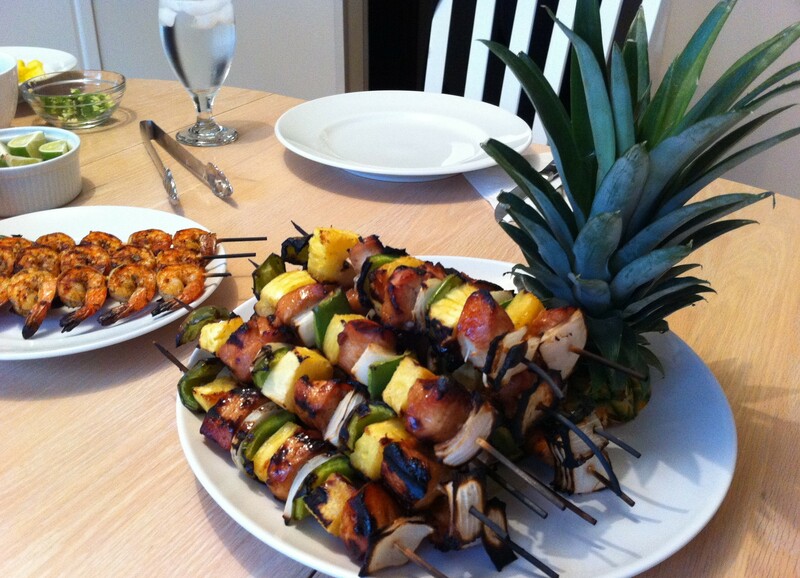 To prepare the marinade, use a large zip lock sealable bag and add ¼ cup of pineapple juice or any fresh citrus juice along with ¼ cup of olive oil and ¼ cup of soy sauce. Now add the minced garlic, garlic powder, ¼ brown sugar, 1 Tbs of kosher salt and 1 tsp of fresh ground black pepper. Seal the zip lock and massage the ingredients together until well incorporated. Add the cubed chicken to the zip lock bag with the marinade and set in the refrigerator for 4-24 hours. 1 1/2 hours before grilling time, it is time to prepare the remaining components of the kabob. In another zip lock bag add the remaining ¼ cup of pineapple juice, ¼ live oil, 2 Tbs soy sauce, 2 Tbs brown sugar, 1 Tbs kosher salt and 1 tsp fresh ground pepper and incorporate together and set aside. Remove the top of the pineapple stalk and set aside for a table garnish, Trim the skin off the pineapple and cube the flesh of the pineapple; removing the core, and cutting into 2 inch cubes and placed in the zip lock bag. Cube 2-3 green peppers removing any seeds and add the same bag and also cube a large Spanish onion and add to the same bag. Allow this bag to marinade for 1 hour in the fridge before continuing. Please note, if you are using wooden skewers you must soak them in water for at least 30 minutes to prevent them from burning and breaking. After 1 hour, preheat a gas grill to medium heat between 375-450 degrees F while assembling the kabobs. 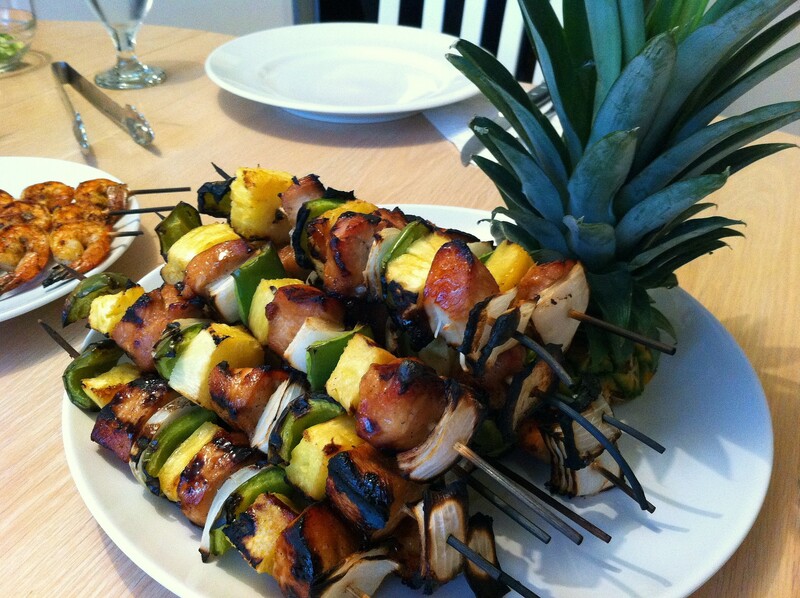 Grill the skewers over medium direct heat for 3-5 minutes per four sides until the chicken is thoroughly cooked. 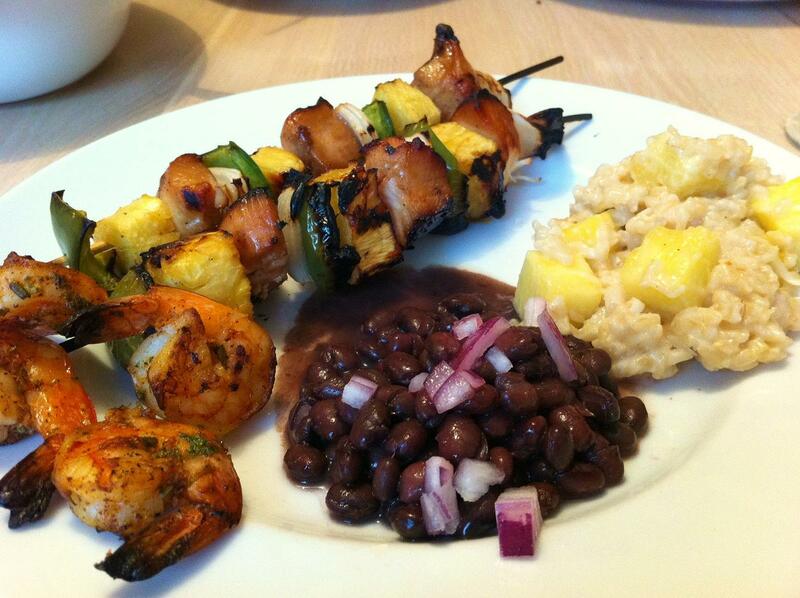 Remove the kabobs from the grill and rest for 5 minutes and serve!